An estimated 80% of all adults suffer from back pain. For most, it’s only a minor inconvenience, but lower back pain can be debilitating, and may even require surgery to correct. And while we cannot prevent every type of back injury or pain, lower back pain does not have to rule our lives. One of the easiest ways for us to easily help our tired, aching backs is by choosing the right recliner. Treating your back while you watch television or read a book sounds pretty good, doesn’t it? 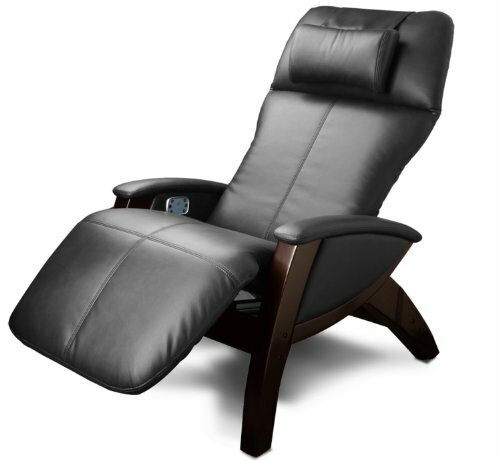 In this article, I will take a look at the best recliners for back pain. I will factor in various things, such as cost, construction, support, weight and even upholstery choices. 1 Why a Specialized Recliner? 2 What Should You Look For When Choosing a Recliner? One of the most common causes of acute back pain is overuse or improper movements. There are helpful daily habits we can develop to avoid these things, of course, but while stretching exercises can certainly help prevent these types of injuries, there is evidence that furniture designed to help support the back can also help to reduce the risk. This is particularly true for people who routinely lift, twist, and engage in other high-risk activities. According to the National Institute of Health, however, one of the second most common reasons for chronic back pain is something to which we all fall prey: aging. As the back ages, it simply becomes less flexible, making us more prone to back injuries. Since most of us spend a good deal of non-work time at home (usually in front of the television), the furniture we use can have a pretty significant impact on how well our backs make it through life. And while a specialized recliner may not be the most important thing you could ever do for your back (proper lifting techniques kind of win on that front!). For those who suffer from chronic back pain, a recliner that is designed to give your back and posture the support it needs may be of immensely useful benefit. What Should You Look For When Choosing a Recliner? What I can tell you to look for is a chair that specifically says it is designed to provide extra lumbar support – if it doesn’t say it, there’s a possibility that it isn’t designed to provide that kind of support, and you may be worse off in the long run. This is not to say that non-lumbar chairs are inherently evil, and some of them are probably very good. In fact, one of the chairs on our list isn’t a lumbar chair. What it means, however, is that you should take extra care when selecting one of these chairs. You also want to look at construction materials. The sturdier, the better when it comes to the frame, and the more supportive – but still pliable – the better when it comes to the cushioning. Hard cushions and backs do nothing for reclining, and a poor-quality frame is not likely to last long, so you’ll want to make certain that these are right. Something else to consider, in addition to size, is weight . . . and it’s the last one that most of us forget when we’re shopping for furniture. With size, it’s sort of a no-brainer – if you can’t get it in the door, you can’t use it . . . but weight is just as important. Remember, there’s a significant chance that you’ll be moving this chair around the room, either when you purchase it or later on, when you decide to rearrange the furniture. At some point that piece of furniture is likely going to have to move, and the lighter the better. Now, a quick search will provide you with more recliner choices than you could possibly hope to see. We’ve narrowed them down, finding the highest-rated recliners according to actual customers. We then narrowed them down to our pick for the top five best recliners for back pain based on weight, construction, and price. 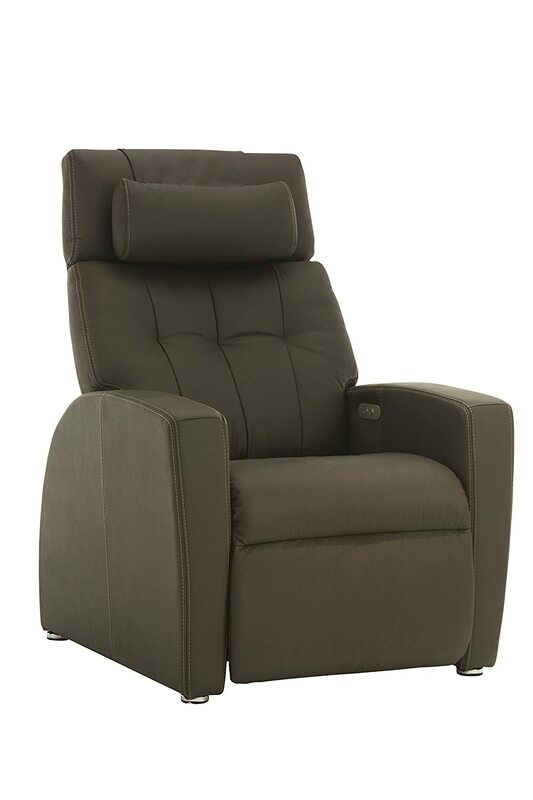 The Homall Recliner and Padded Seat is a sleek, stylish recliner that is designed to support and envelop you. Frankly, it sounds as if it would be easy to fall asleep in it . . . perhaps too easy. The chair is very inexpensive, making this the most affordable chair on this list. The legs of the chair are equipped with rubber feet, preventing damage to wooden floors. It comes with a lifetime replacement guarantee – this covers missing and damaged parts, and a full replacement if you are unsatisfied with the product. The Homall chair does not have a specifically-stated “lumbar support” system. It is almost six feet long when reclined, requiring a fair amount of floor space. It only comes in black, which only mildly limits decorating options. 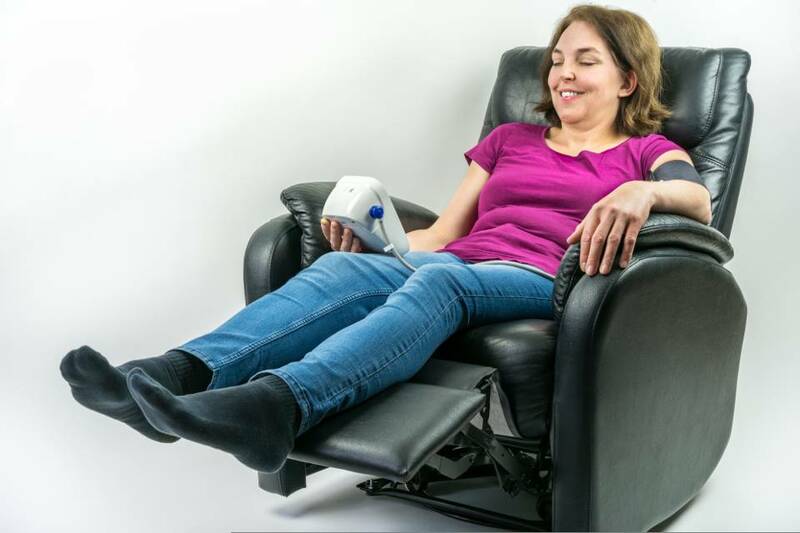 The Svago Zero Gravity Recliner has a slightly misleading name. It does not create a weightless environment around you. Rather, when activated, it puts the user in a position that evenly distributes weight and pressure throughout the body, allowing the back and spine to rest in their natural (healthy) positions. 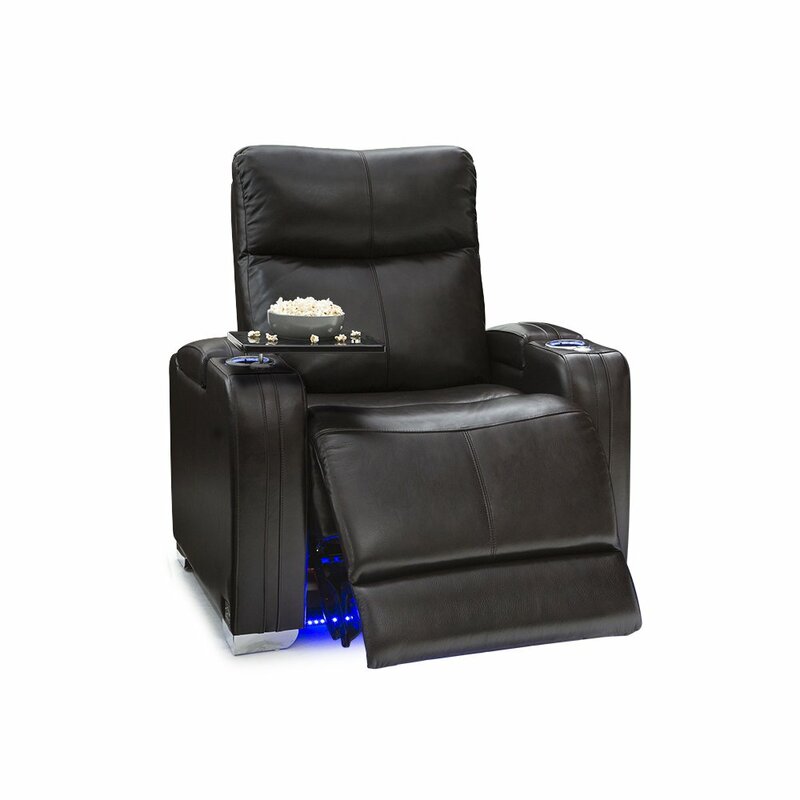 The Svago Zero Gravity Recliner is designed specifically for people who suffer from back issues. It’s design has been NASA-tested. The chair comes with heat therapy. It also has a full six-point massage function, which – along with the heat – helps to loosen and relax tense back muscles. It comes with a removable lumbar support cushion. The upper cushion is also removable. The chair comes in three color choices: black, chocolate, and ivory. Can be controlled with a handy remote controller. It runs on the higher end of price, making it one of the two most expensive chairs on the list. It clocks in at 100 pounds. While not the heaviest, its weight may still make it difficult for someone with lower back issues to move. With lumbar support and its own version of a mini-home theater, the Seatcraft Solstice has some fairly impressive bells and whistles. It’s fully automated, making everything adjustable with just the push of a button, avoiding the unusual position of having to strain your back when pushing the chair into recline mode. The Seatcraft Solstice Recliner comes equipped with cup holders and trays (the cup holders are lit, and the trays can be stored in the armrests, making the entire chair tidy and neat when not in use). It comes pre-installed with “bass shakers” which can connect to a home stereo system (stereo amplifiers not included). It weighs close to 200 pounds, making this the heaviest chair on the list. It runs more affordable than some of the other chairs on the list, but it is still expensive. This recliner not only has lumbar support and different recline modes, but it also has a surprisingly low price tag. Also, made of genuine leather and steel coils, this is a chair high-end chair for a low-end price. Hope you like red, though. It has added lumbar support. It has three different reclining positions, allowing the user to adjust to his or her personal comfort level. 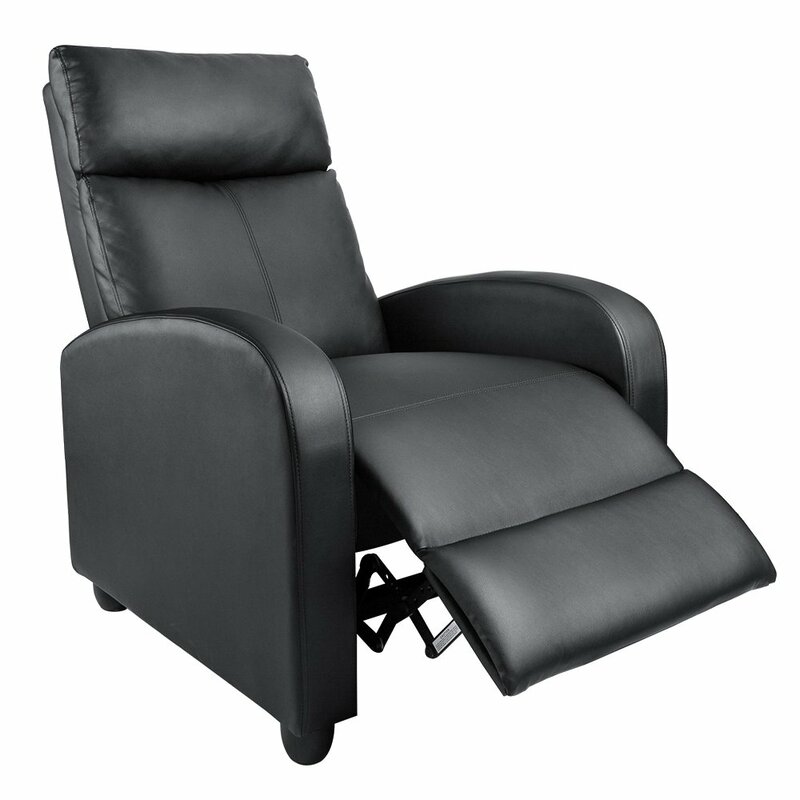 The Brice Club Recliner is made of a sturdy, hardwood frame with added corner supports. It comes with a ten-year limited warranty which, while not lifetime, is still quite long, compared to other chairs. Its price tag makes this far more affordable than some of the other choices. It only weighs 90 pounds – the lightest chair on this list. It currently only comes in one color (Harlee Red). Another Zero Gravity chair, the Luma is, frankly, almost identical to the Svago chair. Its sole purpose is to relax the back with as little pressure as possible – hence the “Zero Gravity” name. However, unlike the Svago, this one does not have heat or massage capabilities, but it maintains the same price. It comes with fully-adjustable head and footrests. Its pillows and cushions, made from Memory Foam, are fully removable. It has two color choices: black leather or sand leather, both of which may be suitable for most color schemes. It comes with a 3-year, on-site limited warranty (this is also a negative: see below). It weighs 120 pounds, making this chair a real back-breaker. The Luma is highly-stylized, and therefore more expensive, but it comes without the added bells and whistles of its competitor, making its price difficult to swallow. It’s 3-year warranty – while certainly better than no warranty – is also significantly less than some of the other chairs on this list. With so many choices out there, it’s difficult to select the best chair for you. In fact, it is overwhelming to see how many choices there are, and how much information is available. If I’m being honest, a good argument could be made for each and every one of these chairs. For those who suffer from chronic back pain and muscle strain, and who have a doctor telling you to help your posture and apply various physical treatments to your back, obviously the Zero Gravity models are the best. If you are on a tight budget, the Homall is a good chair. Plus, it comes with a lifetime replacement guarantee, which is hard to beat. And who doesn’t want a chair with a built-in “sound shaker”? I’m not usually one for home theater systems, but I can think of a couple of movies that would be enhanced by the Seatcraft Recliner (something involving dinosaurs, perhaps . . . or a man in an iron suit). However, when it comes to a total package – lumbar support, price tag, and weight – there is one clear choice: the Brice Club Recliner. While it may not be the cheapest on the list, it’s cheaper by far than three of the other chairs. It’s relatively light, comes with a decade-long warranty, and, while it only has one color, it’s still a smart-looking chair. Yes, the Zero Gravity chairs utilize a seating position that was used by NASA to protect astronauts, and that is difficult to beat. However, most of us don’t have the extra money to spare on a higher-end model chair. And while the Zero Gravity chairs are useful, your back – extreme cases notwithstanding – really only needs lumbar support. Yes, the Homall is cheap. However, saving up that extra money for the lumbar support – particularly if you have frequent, yet intermittent, back pain – may be in your best interest. Remember, I said at the beginning that the extra support is better for you. And as cool as it would be to have my chair shake while watching an awesome and epic fight sequence, at the end of the day, is that privilege worth the extra money? For myself and my budget, I don’t think so. 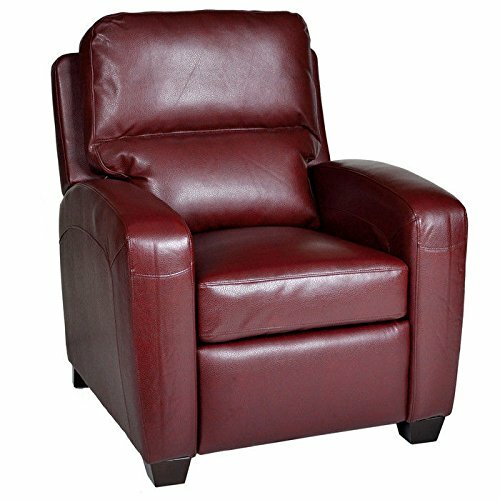 As a whole package, the Brice Club Recliner has the support you need, is relatively light, and comparably affordable. And, no, it doesn’t have a lifetime replacement guarantee, but a decade-long warranty is nothing to sneeze at. In the long-run, the best choice, in my opinion, is the Brice Club Recliner.